Bienvenidos en Peru! Bienvenidos en Huaraz! Bienvenidos en la Cordillera Blanca, the world’s most beautiful tropical mountain range! Probably you arrived here looking for information on trekking, climbing, biking, travelling our tantalizing mountains. We are a small family team that provide guided climbs or treks as small or as big as you want it. Most of the companies here in Huaraz have an office on the main street (Avenida Luzuriaga), we don’t. Some companies will aproach you on that street to sell you (sometimes poorly) organised tours, treks or climbs. We don’t. A small team, no flashy office with posters. That means no overhead cost. What do we have? Experience! 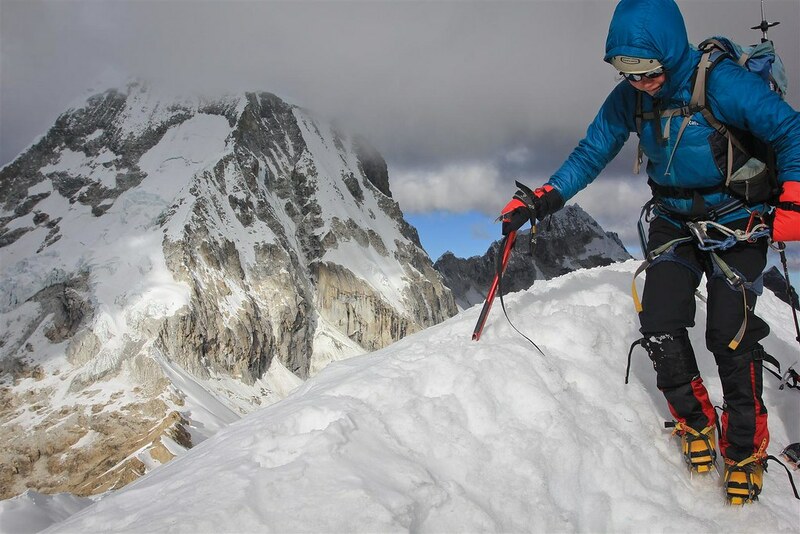 Experience in the Cordillera Blanca’s core business. Trekking and climbing. That means more Soles staying in your pocket. More money for that welcome beer with tasty cuy after a successful climb or exhausting trek. What do we guarantee? Safety and client satisfaction. No compromises. You’re here to enjoy the mountains. We are here to make your trip a succes! Have a look around. And contact us with any request. We won’t bite and overwhelm you with flashy pdf’s with a lot of blabla. What is important is that we make the trip customized to your needs. The programs on this site are just a guidewire. To give you an idea. Everything is possible. You make the trip. We help to make your dreams come true. Bienvenidos! Starting the descend from Nevado Ishinca (5530m).